An open game at the New Bucks Head Stadium was decided by a goal of real quality shortly after break as the Coasters. Manager Dave Challinor handed debuts to five summer signings, including former Chelsea keeper Rhys Taylor, in a new look line-up. Telford were presented with a fantastic opportunity to open the scoring in the second minute, when Dom Collins was harshly adjudged to have fouled David Hibbert on the edge of the area. However, the resultant free-kick from former Coaster Josh Wilson was charged down and cleared to safety. A clever piece of play shortly before the 10-minute mark almost resulted in the first goal. A quick throw-in was flicked on by Danny Rowe but Brendon Daniels fired just over from 15 yards. Telford’s Jack Rea went closer still when he was allowed far too much space to gallop into the Fylde area and forced new keeper Taylor into a fine save. The match was becoming an end-to-end affair and Coasters centre-half Dom Collins really should have done better when he met Daniels’ whipped corner. Fylde were the team in the ascendancy as the half wore on and Rowe wasn’t far off with a snapshot from the edge of the box, after Daniels’ free-kick was blocked. Great work by the corner flag from Bohan Dixon allowed Matty Hughes space to break into the area seconds later but his low drive was turned around the post by James Montgomery. Hughes thought he had grabbed the opener on the half-hour, after a melee in the Telford box, but somehow his goal-bound strike was cleared off the line. The game drifted harmlessly towards the break and as the clock reached 45 minutes a frustrated Rowe was booked for an accumulation of fouls. However, the second half burst into life after just two minutes and it was Rowe who twisted and turned 25 yards from goal before unleashing a piledriver into the bottom left hand corner beyond the helpless clutches of Montgomery. Bucks midfielder Dan Preston should have equalised instantly but somehow fired over from six yards. The lead was so nearly doubled five minutes after the restart, when Daniels delivered a delightful corner from the right only for Josh Langley’s header to crash back off the crossbar. Hibbert was starting to cause Fylde problems at the back and was narrowly too high with a header from Lee Fowler’s inswinging free-kick. Rowe chanced his arm with another thunderbolt of a strike, latching on to a loose ball 20 yards from goal, though his effort whistled wide of the right post. Telford continued to push on for a leveller as Wilson fired a free-kick well over the bar but the Fylde back-line was holding strong. The Bucks had claims for a penalty with just three minutes to play, when Langley challenged former team-mate Wilson, however the referee was unmoved. Bolton loanee George Newell was brought on in the dying stages as the Coasters held out for a valuable three points. 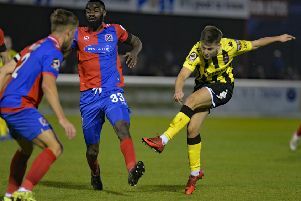 AFC Fylde manager Dave Challinor was pleased that his side were able to overcome difficult conditions to start their season with a victory. Challinor said: “We’re really delighted. It was great to win and fantastic to keep a clean sheet, especially with a side that’s been thrown together over the last 24 hours. “The experience at the back was massive for us and I always felt that with what we’ve got (in attack) we’ll have a chance of winning any game if we can keep clean sheets. “We were certainly not at our expansive best but, like I say, we’ve thrown a team together at 24 hours’ notice. The manager was pleased to see his side grow into the game. He added: “In the first 15 minutes, we looked like a team that hadn’t probably spent a lot of time together. “We were a little bit on the back foot and a little bit uncertain as to what we were doing, but from the 15th minute, we were certainly on the front foot for the rest of the first half. “We know we can be free-scoring and with work that will come. “Our success, especially two years ago, was built on being miserly at one end and free-scoring at the other end. AFC Fylde: Taylor, Holmes, Langley, Collins, Kennedy, Bond, Baker, Dixon, M. Hughes (C.Hughes 73), Daniels (Blinkhorn 81), Rowe (Newell 90). AFC Telford United: Montgomery, Samuels, Campion, Havern, Preston, Rea, Williams, Reynolds (Peers 70), Hibbert (Evans 77), Wilson, Fowler (Monaghan 77).